No frills hotel within walking distance to the Queens Med Hospital. The staff were friendly, helpful and made our stay an exceptional one. the homy atmosphere; friendliness of the employees. Leaving in the morning. It was really very very poor for 51pounds, I expected more. Tiny room. Bleeping traffic lights outside every 28 seconds day and night. Radiator on, couldnt turn off. Not en-suite. Excellent staff, very helpful and welcoming, room was very comfortable and facilities worked very well. Staff helped me find my way around town, telling me good restaurants and pubs to visit, overall very satified with my stay. Very friendly staff. Easy to find, park the car and very convenient. Excellent Service and Price, Value for money. Excellent Staff and really clean place. Home from Home. P&J Hotel This rating is a reflection of how the property compares to the industry standard when it comes to price, facilities and services available. It's based on a self-evaluation by the property. Use this rating to help choose your stay! 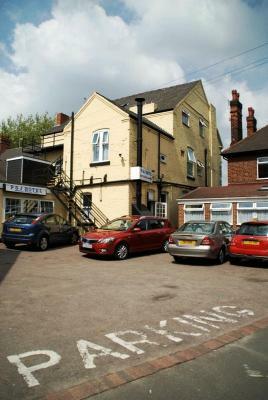 This Edwardian building is in the Lenton area of Nottingham, a mile from the city center and walking distance from Nottingham University and QMC Hospital. It offers free parking and free WiFi. A choice of continental style breakfast or cooked options are available at an extra fee. The family-run P&J Hotel has a relaxing bar and a lounge, as well as a restaurant, starting in March 2017. P&J is 0.7 mi from the Queens Medical Center Campus of the Nottingham University Hospitals NHS Trust. The Kings Meadow campus is 1.2 mi away and the Jubilee campus is 2,950 feet away. There are lots of pubs, cafes, shops and restaurants nearby. All of the rooms are contemporary in style, but in keeping with the historic building. They have TVs, hairdryers and tea/coffee facilities, and feature double-glazed windows. When would you like to stay at P&J Hotel? There is a shared shower room in the hallway. This large room has 2 single beds and one double bed. House Rules P&J Hotel takes special requests – add in the next step! P&amp;J Hotel accepts these cards and reserves the right to temporarily hold an amount prior to arrival. P&J Hotel accepts these cards and reserves the right to temporarily hold an amount prior to arrival. Please inform P&J Hotel of your expected arrival time in advance. You can use the Special Requests box when booking, or contact the property directly using the contact details in your confirmation. It’s really a bed and breakfast not a hotel. Room rather small but ideal for one night’s stay at last minute. Hotel close to Queens Med Ctre with own parking area. Generous English breakfast with plenty of coffee refills! Being asked to hand over my security number on bankcard so they can charge me if I damaged the room and telling me it's policy. First told me one reason, then it was a different reason. Came across as very suspicious. I refused and was then made to feel uncomfortable and the staff wasn't friendly when I left either. Never heard of such a thing in all my time of staying at hotels. Will never go there again. The room was very hot, and there were no valves to turn down the radiator. The manager turned off the boiler for the evening but it came on again in the morning. The room was next to a shared bathroom which was quite noisy (flushing and showering). The room was clean and comfortable. The hotel was very presentable with helpful staff. Breakfast was very good. Parking was good, at the rear. The shared bathroom - hairs on the floor, almost impossible to lock the door - and the street noise. The room had a very uncomfortable wicker chair with little back support. Cosy room, good breakfast at a special price. Nice, congenial atmosphere. On site car park also helps muchly. Bus stop very close by. Good wifi. Breakfast - there was no cereal options, no herbal tea or chocolate for people who dont drink tea or coffee. Dribble of hot water not sure it was hot as couldn't wait, radiator in room didn't work maybe this was because we arrived at 9pm as the bathroom rad was cooling down. In the morning still no rad in the room but the bathroom rad nearly burnt my arm. Didn't have breakfast but the bed was comfortable and the staff helpful also cleaner than most.